My aunt has just gotten engaged and we’re all really excited to have a wedding on this side of the family. Obviously, we’re all a lot more excited about clothes. While my aunt will be scouring for wedding dresses, the rest of us will be going crazy over bridesmaid dresses. None of us have any idea where to start and, as a fashion blogger, I felt that this is my forte, so I’ve given myself the task of finding dresses for everyone. The wedding will be held in the middle of summer, in a small Italian town, so I’ve been looking for dresses accordingly. I asked on Twitter and Rachel mentioned that I should go for something floaty. I’ve been doing a lot research online and found some gorgeous dresses. I think this one is gorgeous. I love how it’s really flowy and has the lovely rose detailing on the sleeve. This is simple and elegant: pretty much exactly what my aunt wanted. It looks like it fits really well. Here’s another really classy and traditional one. I love how there’s a bit of sparkle with the rhinestones on the front. This one is my absolute favourite: it looks like so much fun to wear and it’ll be perfect for Italy. Although my aunt said that she’s not having any bridesmaids, I’m still looking for dresses in that category, seeing as I’m her eldest niece, and hopefully, I think myself, my cousin and aunts aren’t wearing the same dresses. The thing with bridesmaid dresses is that they can be a lot more fun as there are so many different colours and styles to choose from. Here are some lovely ones that I’ve had my eye on. I had decided to get a dress in a pale purple or yellow, so this one is perfect. Chiffon is one of my favourite materials and the layers on the dress look so lovely. This is a perfect style for a wedding. It is gorgeous and, in vibrant blue, would really stand out. This is definitely my favourite dress. The print and shape of it is adorable. And I am a sucker for anything bubble hemmed. So, tell me: what would you wear as a bridesmaid? P.S. This is a sponsored post. So exciting... I've never had a wedding to help plan for! It's been eons since I've last been to a wedding (one that required real dressing up anyway!) - so I wouldn't know what to wear. All these dresses are gorgeous! Weddings are so much fun. Cute blog btw, loving all the outfits. You did say that "she’s not having any bridesmaids." As it is her wedding, you ought to observe point. Personal considerations don't come into it. Regarding the dress, this is a critical decision as it makes the biggest statement on the day, so professional advice is needed. Regarding the wedding, it is best to source an experience planner if you have the budget, for example Mark Niemierko or Tigerlily weddings. My band covers around 70 wedding events each year and we work with some of the best contact in this sector. I really like the one-shouldered dress! You would look stunning in it! And that last one is so you!!! wow. the bride dresses are amazing! How exciting! I've never been a bridesmaid, or even to a wedding! Though one of my friends recently got engaged so that'll change! So exciting! 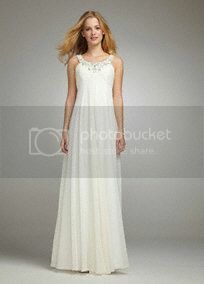 You are right, those wedding dresses are SO elegant...how gorgeous. I too love that bubble hemmed dress! It is chic and a bit flirty...you certainly have amazing sense of style. 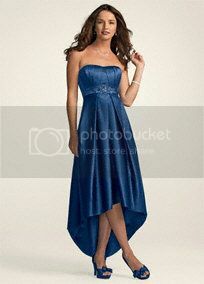 If I were to select my own bridesmaid dress, I might go for something young and fun like a ruffle skirt or tulle under! These flowy wedding dresses are GORGEOUS. They are perfect for a beautiful Italian wedding (which sounds so utterly fabulous, I'm beside myself). I'd go one-shouldered. maybe a bit shorter than the gown you posted, to feel younger. And more in vogue. Wedding plans can be so fun! As long as they're for others :p. I do love to see bridesmaid dresses that have teh same color/print, yet a different cut. I would probably do a 50s, feminine dress, in pale pink of purple. Can't wait to see what you decide on! Oh, I love the long Grecian-inspired dresses, and the idea of floral bridesmaid dresses! You have really good taste in wedding dresses! I like the first two bridesmaid dresses. That second one is so elegant, and I really love the one-shoulder style. Love all these dresses, especially the magenta asymmetric one. I think it would be perfect for the bridesmaids at a black tie wedding! I was just writing a post on this! searching for my sister's wedding :) so fun huh! I love a good wedding, the yellow dress is beautiful. Vibrant Blue!!! That color is amazing!!!! I'm having a wedding on March! I think I'll wear red! I LOVE shopping for weddings! You must be really excited?! Although, traditional Asian weddings are bit like torture, what with all the annoying aunties asking when YOUR wedding will be... Grrr! Ahhhh soooo exciting!! I LOVE weddings so very much! Keep us posted on that planning and how it all turns out!! Oh living Aten who creates life. When you shine forth in the Eastern horizon you fill every land with your beauty. You are so beautiful: you are great; gleaming and high over every land. You are Re and reach out to all your creations, and hold them for your beloved Son. Men see you, but know not your ways. But my best friend is on a hunt to find the perfect dress.. and guess who's coming? ME..
I´m so excited for you! Love the first bride photo. How exciting, congratulations to your aunt. Since I am getting married next year I have been finding some ideas about what I like fashion wise for a wedding. For a bride I like a white dress, fitted and decorative at the top and a full and puffed out skirt sort of like a princess look. 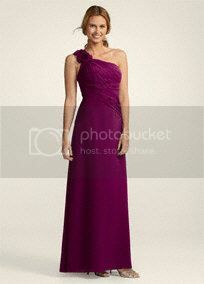 For bridesmaid I think I like purple at the moment but red can be good. I prefer short dresses and I would consider a floral print maybe because it is a bit different from the block colour look that most weddings seem to have. I hope you have fun with this! How exciting! :) Congrats! The winters here are so cold that just the sight of these dresses is making me COLD! Weddings are so exciting; that strapless sweetheart wedding dress is stunning! Love your dress ideas! Very pretty. I don't know what I'd wear as a bridesmaid...as soon as you started talking brides dresses for your Aunt, I immediately thought of one of my favorite L.A. stores on Robertson Ave.
Have fun finding your dress! This is so exciting Sherin! Congrats to your aunt! And the wedding being in Italy, that will be gorgeous! I've always wanted to visit Italy. I think the first wedding gown is breathtaking! I love how flowy and gorgeous it is! Also love that pale yellow dress and the deep purple one. Both stunning shades that I think would look great on you! I adore that first dress. It's SO gorgeous. I just love weddings! Very nice choices!The last wedding dress is my favorite too! !Looks like you'll have a great wedding plan good luck with everything! I love love love love love love X100 the gretchen dress! It is stunning! Now I have to see how much it is. Also love the second one. Ahh I love weddings :). Love the dresses you've picked out, you are going to have so much fun helping to plan all of the outfits! !